I welcome feedback on an experimental feature, exploring ephemerality and URLs, or “ephemerurls”. Here’s the idea: sometimes I’ve posted something on my website that I want to share with some colleagues, but the thing isn’t quite finished yet. I might want to post the URL in some forum (an IRC or Slack channel, an archived mailing list, or on Twitter), but I don’t want the generally accessible URL to be permanently, publicly archived in one of those settings. That is, I want to give out a URL, but the URL should only work temporarily. Right now, that URL will redirect to the original page. (But if you don’t see this email until after 6pm my time, you’ll instead get a 410 Gone error message.) But if the chatroom logs are archived after our meeting (which they often are in groups where I work), the permanent link won’t be useful. Of course, if you follow a URL like that, you might not realize that it’s intended to be a time-boxed URL. So the static page provides a little disclosure to you, letting you know this might not be public, and suggesting that if you share the URL, you use the same ephemeral URL that you received. But ephemerurls also provide a specific, informal ephemerality, another increasingly popular privacy feature. It’s not effective against a malicious attacker — if I don’t want you to see my content or I don’t trust you to follow some basic norms of sharing, then this feature won’t stop you, and I’m not sure anything on the Web really could — but it uses norms and the way we often share URLs to introduce another layer of control over sharing information. Snapchat is great not because it could somehow prevent a malicious recipient from taking a screenshot, but because it introduces a norm of disappearance, which makes a certain kind of informal sharing easier. I’d like to see the same kinds of sharing available on the Web. Disappearing URLs might be one piece, but folks are also talking about easy ways to make social media posts have a pre-determined lifetime where they’ll automatically disappear. What do you think? Code, documentation, issues, etc. on Github. 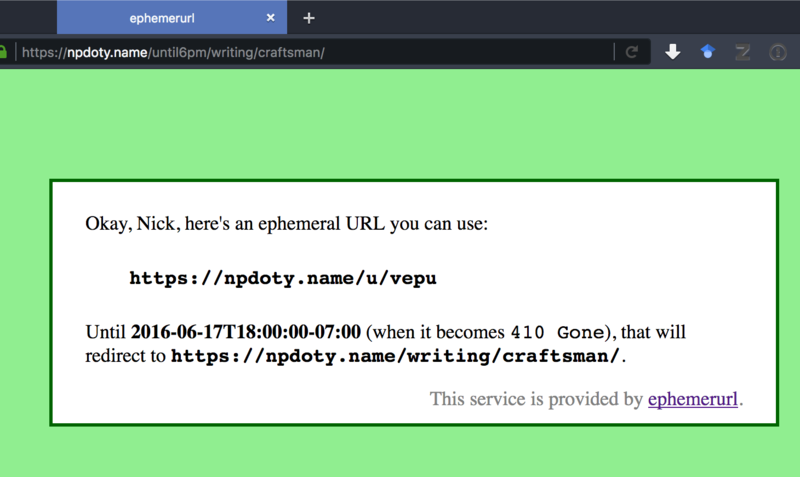 Update: it’s been pointed out (thanks Seb, Andrew) that while I’ve built and deployed this for my own domain, it would also make sense to have a standalone service (you know, like bit.ly) that created ephemeral URLs that could work for any page on the Web without having to install some PHP. It’s like perma.cc, but the opposite. See issue #1. P.S. Thanks to the Homebrew Website Club for their useful feedback when I presented some of this last month. Securing the Web, even our little websites, is important — to set a good example, to maintain the confidentiality and integrity of our visitors, to get the best Google search ranking. While secure Web connections had been difficult and/or costly in the past, more recently, migrating a site to HTTPS has become fairly straightforward and costs $0 a year. It may get even easier in the future, but for now, the following steps should do the trick. P.S. Yes, other friends, I recommend WebFaction as a host; I’ve been very happy with them. Services are reasonably priced and easy to use and I can SSH into a server and install stuff. Sign up via this affiliate link and maybe I get a discount on my service or something. P.S. And really, let me know if and when you have issues. Encrypting access to your website has gotten easier, but it needs to become much easier still, and one part of that is knowing which parts of the process prove to be the most cumbersome. I’ll make sure your feedback gets to the appropriate people who can, for realsies, make changes as necessary to standards and implementations. Updated 27 November 2018: As of Fall 2018, WebFaction's control panel now handles installing and renewing Let's Encrypt certificates, and that functionality also breaks by default the scripts described below (you'll likely start getting email errors regarding a 404 error in loading .well-known/acme-challenge). I recommend using WebFaction's Let's Encrypt support, review their simple one-button documentation. This blog post contains the full documentation in case it still proves useful, but if you want to run these scripts, you'll also want to review this issue regarding nginx configuration. Updated 2 December 2016: to use new letsencrypt-webfaction design, which uses WebFaction's API and doesn't require emails and waiting for manual certificate installation. One day soon I hope WebFaction will make more of these steps unnecessary, but the configuring and testing will be something you have to do manually in pretty much any case. WebFaction now supports installing and renewing certificates with Let's Encrypt just by clicking a button in the control panel! While the full instructions are still included here, you should mostly only need to follow my directions for Create a secure version of your website in the WebFaction Control Panel, Test your website over HTTPS, and Redirect your HTTP site. You should be able to complete all of this in an hour some evening. Login to the Web Faction Control Panel, choose the “DOMAINS/WEBSITES” tab and then click “Websites”. “Add new website”, one that will correspond to one of your existing websites. I suggest choosing a name like existingname-secure. Choose “Encrypted website (https)”. For Domains, testing will be easiest if you choose both your custom domain and a subdomain of yourusername.webfactional.com. (If you don’t have one of those subdomains set up, switch to the Domains tab and add it real quick.) 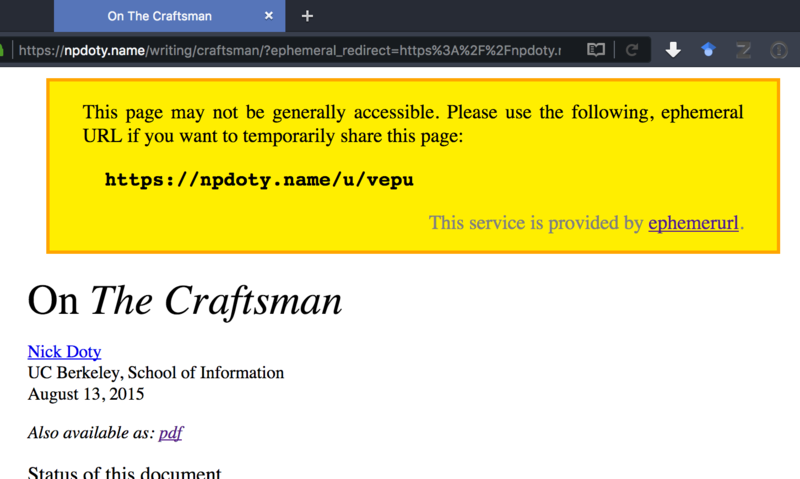 So, for my site, I chose npdoty.name and npdoty.npd.webfactional.com. Finally, for “Contents”, click “Re-use an existing application” and select whatever application (or multiple applications) you’re currently using for your http:// site. Click “Save” and this step is done. This shouldn’t affect your existing site one whit. Mixed Content: The page at ‘https://npdoty.name/’ was loaded over HTTPS, but requested an insecure image ‘http://example.com/blah.jpg’. This content should also be served over HTTPS. Change these URLs so that they point to https://example.com/blah.jpg (you could also use a scheme-relative URL, like //example.com/blah.jpg) and update the files on the webserver and re-test. Good job! Now, https://subdomain.yourusername.webfactional.com should work just fine, but https://yourcustomdomain.com shows a really scary message. You need a proper certificate. Let’s Encrypt is a new, free, automated certificate authority from a bunch of wonderful people. But to get it to setup certificates on WebFaction is a little tricky, so we’ll use the letsencrypt-webfaction utility —- thanks will-in-wi! SSH into the server with ssh yourusername@yourusername.webfactional.com. If all went well, you’ll see nothing on the command line. To confirm that the certificate was created successfully, check the SSL certificates tab on the WebFaction Control Panel. ("Aren't these more properly called TLS certificates?" Yes. So it goes.) You should see a certificate listed that is valid for your domain yourcustomdomain.com; click on it and you can see the expiry date and a bunch of gobblydegook which actually is the contents of the certificate. To actually apply that certificate, head back to the Websites tab, select the -secure version of your website from the list and in the Security section, choose the certificate you just created from the dropdown menu. This time you get to test it for real. Load https://yourcustomdomain.com in your browser. (You may need to force refresh to get the new certificate.) Hopefully it loads smoothly and without any mixed content warnings. Congrats, your site is available over HTTPS! You are not done. You might think you are done, but if you think so, you are wrong. Certificates from Let’s Encrypt expire in no more than 90 days. (Why? There are two good reasons.) Your certificates aren’t truly set up until you’ve set them up to renew automatically. You do not want to do this manually every few months; you will forget, I promise. If you haven’t done this before, this file will be empty, and you’ll want to test it to see how it works. Paste the following line of code exactly, and then hit Ctrl-O and Ctrl-X to save and exit. This will output to that log every single minute; not a good cron job to have in general, but a handy test. Wait a few minutes and check ~/logs/user/cron.log to make sure it’s working. With that cron job configured, you'll automatically get a new certificate at 4am on the 15th of alternating months (January, March, May, July, September, November). New certificates every two months is fine, though one day in the future we might change this to get a new certificate every few days; before then WebFaction will have taken over the renewal process anyway. Debugging cron jobs can be tricky (I've had to update the command in this post once already); I recommend adding an alert to your calendar for the day after the first time this renewal is supposed to happen, to remind yourself to confirm that it worked. If it didn't work, any error messages should be stored in the cron.log file. Now you’re serving your website in parallel via http:// and https://. You can keep doing that for a while, but everyone who follows old links to the HTTP site won’t get the added security, so it’s best to start permanently re-directing the HTTP version to HTTPS. This particular variation will both redirect any URLs that have www to the “naked” domain and make all requests HTTPS. And in the Control Panel, make the redirect application the only one on the HTTP version of your site. You can re-use the “redirect” application for different domains. This "Great Works of Software" piece is fantastic. Of course I want to correct it, and I'm sure everyone does and I'm fairly confident that was the intention of it, and getting everyone to reflect and debate the greatest pieces of software is as worthy of an intention for a blog post (even one hosted on Medium) as any I can think of. I don't dispute any of your five , but I was surprised by something: where are the Internet and the Web? Sure, the Web is a little young at 25, but it's old enough to have been declared dead a good handful of times and the Internet calls Word and Photoshop young whippersnappers. Does the Web satisfy your criteria of everyday, meaningful use? Of course. But I'm guessing that you didn't just forget the Web when writing about meaningful software. Instead, I suspect you very intentionally chose  to leave these out to illustrate an important point: that the Web isn't a single piece of software in the same sense that the programs you listed are. The Web is made up of software (and hardware): web server software running on millions of machines all around the world; user agents running on every client machine we can think of (desktop, mobile, laptop, refrigerator); proxies and caching middleboxes; DNS servers; software and firmware running on routers and switches, in Internet Exchange Points and Internet Service Providers; software not included in this classification; crawlers constantly indexing and archiving Web pages; open source libraries which encrypt communications for Transport Layer Security; et cetera. But even if one had an overly-simplified view of Web architecture (and I wouldn't criticize anyone for this; this is the poor-man's Web architecture that I teach students all the time) consisting of servers and browsers, anyone would see that there's no singular piece of software involved. You mentioned the TCP/IP stack as a runner up, but there's no single TCP/IP implementation that's particularly great or important: what's important is that separate implementations of the relevant IETF standards interoperate . Other listmakers included a browser (Kirschenbaum highlighted Mosaic ; PC World, Navigator) or you could imagine listing Apache as a canonical server (and the corresponding foundation and software development methodology), but even as important as those pieces were (and are! ), alone they just don't make a difference. As a thought experiment then, I submit a preliminary list for a Web software canon, listing not single pieces of software but systems of software, standards and people. Okay, I'm skeptical about Emacs -- isn't the operating system/joining of small software pieces already well-covered by Unix? By the Principle of Charity. It might be tempting, for someone who works on Web standards like I do, to claim that the Web is really just a set of interoperable standards, but that's nonsense as soon as I think about it at all. Sure, I think standards are important, but a standard without an implementation is just a bit of text somewhere. An of course, that's not hypothetical at all: standards without widespread implementation are commonplace, and bittersweet. Also, Kirschenbaum includes Hypercard in his list, with a reference to Vannevar Bush and the Memex, which I love, and it might be the closest in these lists to something that looks like the Web/hypertext but in non-networked single-piece-of-software form. Kelty, Christopher M. Two Bits: The Cultural Significance of Free Software. Duke University Press Books, 2008.